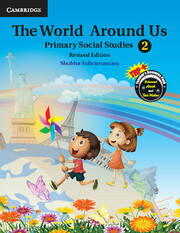 The World Around Us is a comprehensive Social Studies series for classes 1 to 5. The World Around Us is a comprehensive Social Studies series for classes 1 to 5. The series gives a basic introduction of History, Geography and Civics to prepare the learners for the middle school years where these subjects would be an important component of the curriculum. This revised edition is based on the user feedback and changing needs of the learner. It includes engaging exercises and activities that link the school environment to the life a child leads in the society. Each book in the series has many new components, activities, illustrations and images to interest the young minds. I Shall Learn outlines the learning objectives of the lesson. Activity includes in-text activities based on skills such as application, analysing and exploring. Value Tip! gives value education tips. I Learnt provides summary of the chapter along with a quick self-assessment checklist. Get Set, Go! consists of exercises to assess the knowledge of the concepts learnt including questions based on HOTS (High Order Thinking Skills).